Delacorte Books for Young Readers, 9780553534061, 272pp. The second book in the Legendtopia series, fast-paced action-adventure novels that will have you racing through the pages to get to the fantastical finish! 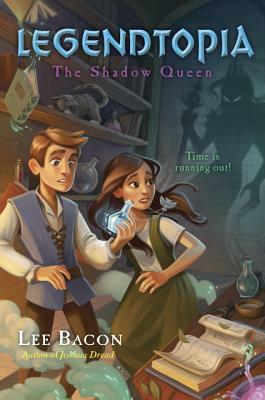 Two kids—Kara, a girl from our world, and Prince Fred, a royal boy from the kingdom of Heldstone—join forces to save Urth. Kara and her royal BFF, Prince Fred, are on the most important mission of their lives. Kara’s long-lost dad is trapped in the magical kingdom of Heldstone—and the two friends are on an epic quest to rescue him. It won’t be easy. Heldstone is bustling with parades and parties in preparation for the Luminary Ball, an incredible celebration of the royal family. But not everyone is in the mood to celebrate. The evil Sorceress has transformed into the Shadow Queen. She has poisoned the prince’s parents, and unless Kara and Fred find an antidote, the king and queen will be dead in three days. Their search will take them outside the palace walls, into an enchanting and dangerous world of talking animals, fierce monsters, and vegetarian trolls . . . all the while being hunted by the Sorceress and her evil army of shadows. Can Kara and Fred save their parents? Or will the Shadow Queen destroy them all? Lee Bacon is the author of Legendtopia: The Battle for Urth and the Joshua Dread series. He grew up in Texas. For two years he lived in Germany, where he encountered many castles and zero dragons. He now lives in New Jersey. Visit leebaconbooks.com.